Most clams, including the colorful giant clams available in the pet trade, are marine animals and so they need a saltwater aquarium. Seawater contains a large number of different elements in solution. Table salt by itself is not enough, even if it is marked as sea salt. 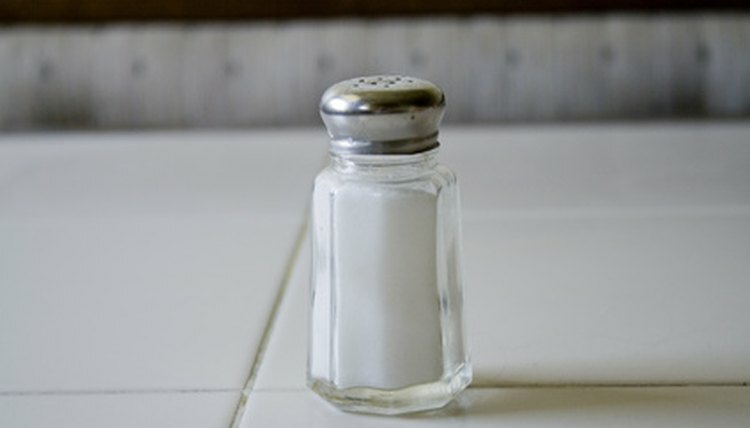 Nearly pure sodium chloride, which is what table salt is, will certainly make salty water. It will not, however, make a seawater substitute. Most aquarium suppliers stock a salt mix that usually comes with detailed instructions. Note that the tank needs to cycle for several weeks before adding any animals and a few months before adding clams. These instructions are for preparing salt water for partial water changes. Measure as much distilled water as you need into a large bucket, keeping a mental note of how much water was used. Add a little extra just in case. Place an aquarium heater in the bucket and heat the water until it's the temperature of your aquarium. For giant clams, this will normally be about 78 to 82 degrees F.
Add salt mix to make up a seawater-strength solution as indicated on the packaging. This usually means about half a cup of the mix per gallon of water. Stir the mixture thoroughly until all the salt has dissolved. Check the salt concentration with a salinity probe. It should be the same as the water already in the tank -- which is with a specific gravity of about 1.025 for most species of giant clam. Use the solution as required for partial water changes or for setting up a tank, remembering that this is only one of the multitude of steps required to set up a marine tank. Test the aquarium tank water using nitrate and calcium test kits a couple of days after you have conducted the water change. Giant clams need low levels of both for shell building and to maintain their symbiotic algae. Nitrate levels should be below 2 parts per million, but above zero and calcium between 380 to 450 parts per million. Add aquarium additives if required.  A reef aquarium needs to cycle for several weeks to allow populations of essential microorganisms to establish themselves before you add any creatures at all. Putting clams, or any other animal, straight in once you’ve set up the tank will kill them. In the case of giant clams, which get much of their nutrition from the surrounding water, the more mature the tank, the better. They are not a good choice in a relatively new tank. ⚠ Do not use metal buckets or utensils when making the solution, which would contaminate it.